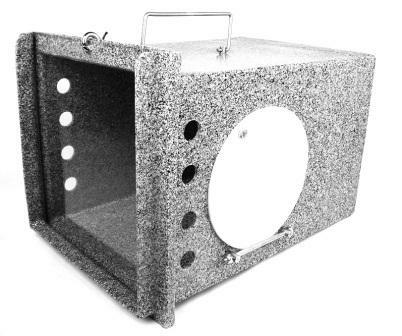 Model 721 can be used as a cat handler or provide a quiet place to hide within larger holding cages. These units provide animals a quiet place to hide within larger holding cages. They can also be used as transfer cages as they match up nicely to the back of our TNR traps and cages. Our cat handlers are easy to disinfect as there are no nuts or bolts protruding into the inside of the unit. They have an acrylic sliding door to allow handlers to check on animals without disturbing them. And they have a porthole door with flip down cover. Simply close the porthole door to secure the animal inside, and remove the unit from the cage for cleaning, treatment, or transport.